Light. Emotion. Installation. We defy the depression of winterly light deprivation. We need the light – especially during the dark season. Light caresses our soul. Light is life. Light makes us healthy. Darkness surrounds us on the way to work and on the way home. Dark. Cold. Bowed heads. A trifle of well being for our soul. A shot of brightness, a little sunray! Against gloomy thoughts. Light that warms our heart. The saving anchor after a wonderful summer. We build a special light art installation. A walkable Light_Shower in public space. People approach, walk through or stay within. They are illuminated, yes, showered with light. They are literally delighted and fascinated by the light spiel. A delicate gate filled with elegant light objects, part cool light, part colourful warm light. A light construction fixed onto black steel cables. The installation invites to catch light and happiness. It seems to hover freely – just like the sun – over the heads of the light seekers. Shortly before the winter solstice, when days are shortest, many people suffer from a lack of daylight. They become lethargic, tired and need more sleep. Too little daylight provokes the body to produce more melatonin, which in turn is responsible for this depressive condition. 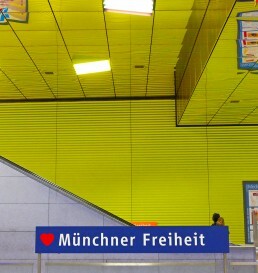 That´s why we donated a 200.000 Lux Light_Shower to the citizens of Munich. The light art installation was erected at the Munich Gasteig, directly in front of the entrance to the Philharmonc Hall. It was equipped with 18 high-end spots which altogether generated 200.000 Lux. The effect on the people was really impressive. When exposed to sun-equivalent light, the body produces more of the hormone serotonin, which is also known as hormone of happiness and has a positive impact on our mood. In the centre of Munich, directly beneath us there are impressive rain retention basins with vast dimensions. One of those domes lies underneath the Hirschgarten and for one day served as the stage of a breath-taking light- and sound installation. The municipal drainage operations of Munich opened its doors for visitors. Visitors could inspect the vast halls while the halls were simultaneously put in the limelight by a mystical and artful light and sound installation. The light installation »Light Dive« simulated flowing water and explained the system of the retention basis in an artistic manner. The flow of light was accompanied musically by the Munich tenor Andreas Staubinger. Green and blue light starts to light up in the back of the basin of the lowest level, simulating flowing water. The flowing light penetrates the openings and overflows the threshold. Blue light streams plunge in swirling movements downwards, similar to a waterfall. The movement creates fog that rises along the wall. The entire hall is enriched with blue light in gentle flowing motion. The basin fills up and is gently deprived of the light. The light-gauge descends and the water is gradually returned to its natural system. All phases of the light-installation are accompanied by the classical tenor Andreas Stauber with excerpts of Lohengrin, an opera by Richard Wagner. We would like to extend our special thanks to the entire mbeam team (Nicole, Laure and Robert), to LiveCo (Tilo, Julian, Tom...), to the Münchner Stadtentwässerung , Michael Buchmann (Film) and to Andreas Stauber (Vocals). How to create an impressive christmas light art installation for the Christmas season that simultaneously guides passengers subconsciously towards a certain direction? That was the challenge of the city of Munich for mbeam. An eye-catching light installation should be installed at the scaffolded façade of the famous Ruffini House in Munich which attracts passengers already from the distance and guides them into the new pedestrian zone of Sendlinger Strasse. For this challenge, light designer Manfred Beck was mainly inspired by famous fairy tale “Sterntaler” of the Grimm brothers. The heart breaking story is much about altruistic giving and consequently was a perfect fit for the spirit of Christmas time. Beck designed individual light objects for the façade, which were then elaborately produced and installed. The over dimensioned sparkling stars and objects, consist of altogether 6.000 light elements in warm white and around 450m of light lines. 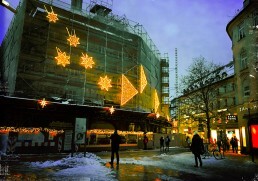 Big sparkling stars fall down on the façade and finally are transformed into huge arrows, guiding the passengers into the pedestrian zone of new Sendlinger Strasse. The guiding effect is reinforced by subtle and gentle shifts in light intensity. Despite its dimension, the light installation only consumes 600 watts in energy. 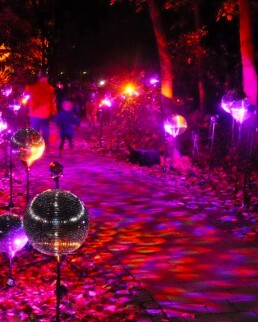 The official opening ceremony of the light installation “Sternen_Weg” (Path of Stars) took place on December 27th and was celebrated by the city of Munich along with numerous members of the press. How can one make sound visible? How does light sound? The lighting art concept “LightBellsSound” transforms the sound of 7 bells directly into light with various colors and shapes. Each bell tells its own story in a particular tone pitch and intensity. You can see light lines dancing to the vibes of the bell sound from the observation desk of St. Peters’ Church. 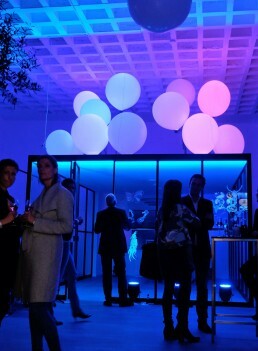 mbeam was contracted by the reputable daily newspaper Süddeutsche Zeitung (SZ) to develop the idea and the concept for a light installation and its implementation during their event “Abend im Mai”. The installation should reflect the professional work and competence of the publisher while at the same time transporting the digitalization of the media landscape, using the vast space of their atrium as its stage. Around 700 selected guests from politics, business and cultural life – amongst which the who’s who in Bavaria – met at the publishers house which gathers information from the entire world and which aspires to bring order into a complex world, to filter out the essential and bring it into the light. Regional, national and international news and topics are being transported by typo, picture, animation and light. The SZ, a media with the professional competence to transform complex issues into graspable words, lines and essays. To create transparency and make information available on all channels. This was the primary theme that mbeam used to transform the space of the atrium into a “Digital Space”. The vast atrium of the SZ becomes the light installation and transports the theme “Digitalization” via animation and light in space. The color pixels on the side of the atrium visualize the daily flood of information. The information is filtered and investigated by the editors for their content of truth and only then published to its readers. The daily maze of information, shown as colorful pixels on the walls that are constantly changing in color and intensity, symbolize the digital world and the vast diversity of news, tendencies and opinions. They are being selected and drawn onto the “Light Bridge”, transformed into headlines and news, actually published by the SZ. The space transforms into a Digital Light Metaphor and creates a digital dynamic. It keeps changing throughout the entire event, shows constantly new and actual content and inspires the guests to talk and discuss. Look around! With the Light Installation „Gold or Love“ („Two Souls...“). mbeam would like to draw attention to the persisting actuality of Goethes grand work „Faust“, because the drama is more relevant today than ever. mbeam decided, to put Sergey Brin, the President of Alphabet, Googles parent company, into the spotlight. Google can be viewed as the digitalization of Dr. Faust´s search for universal knowledge. Knowledge is power. And Google is real. Google is Larry Page and Sergey Brin, its creators. They have power and money. An unbelievable quantity of money. But are they loved for their achievements? There he hangs, Sergey Brin, in front of the creative office of mbeam. He seems dynamic and determined in his suit and t-shirt outfit. Riding in style on top of an illuminated globe, naturally equipped with a Google-Glass. Suddenly he is material. His physical presence let him appear less threatening, yes, almost fragile. That´s what he looks like. Which is he now, good or evil? Google never wanted to be evil. In fact “Don’t be evil” was the companies motto for a long time. But Google also stands for power and money, fed by the data of all mankind. What does Google know exactly about everyone of us? What exactly do they do with our data? These questions can now be asked directly to the sculpture, which has been created by the sculptor Andreas Pfenninger. But don´t expect any answers, neither expect any from Google if you ask how their search algorithms actually work. Does Sergey Brin love his gold? Is he happy now, being one of the richest men on earth? Or has his work already spun of and became autonomous? Who asks Sergey the all-important (Gretchen´s) question? On December 1st, Director of tourism Dr. Gabriele Weishaeupl launched an exceptional light installation at the Ruffini-House in Munich. Residents as well as visitors were invited to enjoy the magic of an impressive piece of Munich history displayed on the house built by Gabriel von Seidl for the duration of the Christmas Market. The impressive Ruffini-House at the old cattle-market was center of this “LichtStory” – an oversized Christmas gift by the city to the citizens at the Christmas Market. Equipped with the latest illumination technology and impressive attention to detail, mbeam dipped the building in picturesque colors. For example, plants appeared in living green, characters obtained a beautiful skin color and colourful clothes. During evening and night, high-performance projectors were throwing unique and artful illustrations with high accuracy onto the façade of the Ruffini-House. The façade turned into a sophisticated scenery of light painting art. To make inventions and innovations visible and perceptible to the spectators and the staff. To visualize their effect on the society and our life with an impressive lighting installation. That was the challenging task, which the European Patent Office entrusted us with. The lighting art installation should inspire the staff, international guests as well as the inhabitants of Munich. The imposing building of the EPO in Munich, directly at the river Isar is transformed to a Light-Methaphor. The light wave symbolizes the infinity of the human conceptual world and ideas – finally the vast number of patents of the entire European Union. 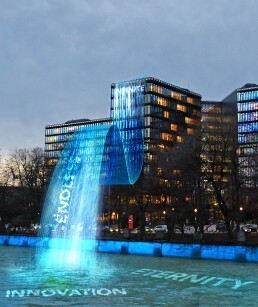 The entire facade of the EPO is filled via projection with water, which symbolizes the multitude of ideas and patents which are processed at the EPO. The water then flows in form of a gigantic light wave from the middle part of the building along the façade over the street and disembogues into the river Isar. Where the waterfall, the wave of ideas, meets the river, gently animated words are projected onto the surface. Word after word emanating from the idea of infinity of human thoughts and ideas complete the picture and flow along the current of the Isar and into the endless cycle of the water. A wall of water, 30 meters high is created via high tech nozzles and pumps in the river Isar, at level with the headquarters of the EPO. This wall serves as a semi-transparent and dynamic projection screen. The content of the projection is visible from both sides. At the same time, concentric circles are emerging and growing on the façade of the EPO building, as if spattered from the wall of water. The circles are animated in a wave movement and slowly expand towards the borders of the building. The wall of water is constantly immersed into different colours and pictures which are simultaneously reflected on the ensemble of buildings of the EPO. A marvellous Pop up light installation for a temporary empty building. Empty buildings always carry a certain sadness. They convey the feeling of loneliness and lifelessness, which are often passed on to the entire street or the district. It´s those feelings that our client wanted to break and transform into attractive feelings of curiosity and homeliness. mbeam created a flower of light which slowly grows and softly changes its colours and thereby submerge the room and the entire building into an ever changing new light. Curiosity and anticipation are aroused. The passer by stands amazed in front of the shop window and tries to guess what comes next, which colour, which form and above all: which kind of shop will move into this building next? Blooming Lights transforms the empty shop into a homely and warm shape of light and creates a point of attraction in the district. It arouses curiosity and pleasure in walking by and the passers by take in the positive feelings created by this marvellous installation of light art. Apollonia, the splendid woman with bare breasts, sways in a swing in-between illuminated watering cans and tries to catch their light. She collects the warmth of the light, a source of energy, and lovingly passes it on to those passers by who halt and pause in front of the light installation in order to observe her. She is the mbeam Godess of Light, who gives love, joy and comfort. The splendid sculpture »Apollonia« was created by the renowned sculptor Art Pfenninger – many thanks to you, Andreas. On the occasion of the opening of the new flagship store of Renésim in Munich mbeam created an artful light installation with the theme »Dance of Creativity«. The long established company RENÉSIM – Fine Jewellery manufactures personal, handmade jewellery in highest quality. Every piece of jewellery is unique and tailor made to their individual customers desires. Creation is a process– sketch, elaborate, delete, discard, revive, change – the entire spectrum of creative work resulting in a perfect finishing. A cube of glass forms the centre of the light installation. The clear special structure of the cube is interrupted by a variety of light globes in various sizes which hover underneath the cealing and above the cube, creating the illusion of floating light balloons desiring to lift the cube into the air. Each balloon is individually controllable via radio transmission and corresponds with the light elements in the glass cube. The balloons are white at the beginning of the event and blend sheer weightlessly with the bright room and the airy architecture. Subsequently the start to gleam in an animated, changing light. The light is dancing with the rhythm of the music. The animated balloons and the light elements of the glass cube form together a surreal space within space. The delicate cube starts to float. As another highlight of the evening Carsten Knappe, a renowned illustrator, is painting live images onto the glass cube. The motives of the images are inspired by history of Renésim. By applying various colours, a connection to the light, a RGB-Effect is created which bestows a strong momentum to the images – a creative dance of the motives. Our special thanks to: Matthias Singer and Nicole (Nicl). Millions of tiny mirrors, small light catchers in our light installation „Aura Solis“, tell a poetic story of the new technology of E.ON Aura. A large section of the Light-Run in Paderborn is uniquely iluminated, using energy won by sunlight and immerse the track into an aura of sparkling light. A large part of the track was lined by countless small and big sparkling light spheres. These spheres were flooded with light from various directions. Part of the light spheres were mounted on stands so that countless reflections fell not only onto the track, but also the trees and the athletes. The wirelessly controlled spots accompany the athletes interactively. A harmonic basic mood of light increases in intensity and colour when participants oft he run approach. The increase in intensity motivates and enourages the athlete to keep on going. A impressive and exhilarating experience for the athletes and the spectators. The special feature of the event, however, lies in the source oft he energy. Photovoltaic modules have collected the energy of the sun throughout the day. The energy was then stored in the new E.ON Aura storage and released during the night event. Only 1.500 watts were consumed for this sustainable light art installation. It was the first nightly running event illuminated by this new technology and we at mbeam are very proud to set the scene for this new storage technology with our light installation. Many thanks to the entire team (Matthias Singer, Laura, Nicole,…) to the E.ON Germany Team und to LiveCo for the successful implementation of the sustainable light installation. mbeam was awarded by Kinopolis GmbH & Co Cineplex KG the project to equip Cinema No. 6 mk6 of the Mathäser Filmpalast in Munich with an entirely new light concept. In the centre of the considerations stood the question: “How can we by means of light optimise the ambience of the cinema in a way that creates additional value to the visit without divert the spectator from the essential, the movie?” In the end there should remain a positive sentiment and the movie experience in the Cinema No. 6 should be an unforgettable one. Different “Light Scenarios” have been programmed during the various stages of the movie performance, the entrance, commercials, ice cream break, trailers and closing credits. The various Light Scenarios create different moods and atmospheric pictures, i.e. build-up of suspense in the beginning, a holiday feeling during the ice cream break and slow awakening during the closing credits. The trailers (e.g. THX, Dolby Atmos and Mathäser) were visually supported by projecting their colour moods and moving objects from the screen onto the walls into the auditorium, thus creating a 360° experience for the viewer and the feeling to be in the centre of action rather than a spectator, only. mbeam developed a concept which immerses the entire auditorium into a variety of different Light Scenes with a 360° effect in accordance with the mood on the screen. The movie experience in the Cinema mk6 in the Mathäser Filmpalast has transformed and obtained its own Light-Identity. In order to achieve this effect, around 57.000 RGB LED lights and other light objects, moving heads and fibre optics have been installed. Additional elements of white LED-light have been added to shape the light effect stronger and more dynamical. All of those elements are individually controllable by DMX and programmable to individual Light Choreographies. All Light Scenarios of the Light Choreography have been programmed and automatized in advance. The additional effects for the trailers have been tailor made (programmed), integrating them into the original trailer, taking into consideration shape and volume of the auditorium. The Promenadeplatz bursts into light under oversized light balls, which float in the trees and invite you to marvel and to dwell. This impressive Lichterwald with its 60.000 sparkling light dots is an attraction worth visiting in downtown Munich during Christmas time. The Promenadeplatz has tradition when it comes to experience an atmospheric Christmas time. At the beginning of the 19th century the Nikolaidult – precursor of todays Christmas market ¬– settled down on todays Promenadeplatz. At that time one could buy “goods from Oberammergau and ginger bread from Nurnberg, cotton wool kids clothes, crib figures, chimney sweeper, dried fruit and almonds as well as small pictures of Santa Claus, nuns and hermits” according to chronicler Michael Schattenhofer. With this wintery light art installation today’s residents would like to remind us of the rich tradition of this historical place. 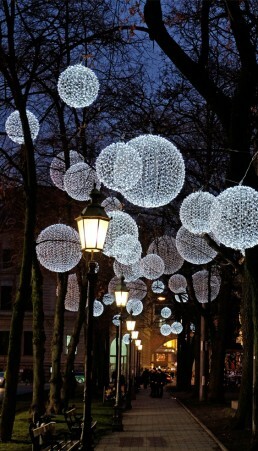 The sparkling and floating light balls in various sizes along the side walk turn the Promenadeplatz into a wintery Lichterwald. The oversized light objects float like gigantic snow crystals in the wintery sky and enchants the Promenadeplatz. “We are pleased about putting this project into place and are positive to welcome many people to the Promenadeplatz, who are excited about the Lichterwald”, says the initiator of the project Innegrit Volkhardt, owner and managing director the Hotel Bayerischer Hof. mbeam was asked to set up a light installation for the employee event of Pioneer Invest at the Allianz Arena. Requirement was to carry the entire concept as well as its content, while making it noticeable and perceptible. The company wanted its employees to get excited about new challenges and channel all energy into a common direction. A special adventure course was set up, though which the visitors were guided after having dinner together and on their way to the club area for partying. The adventure course symbolized the tension during a period of transition between the old and the new. Fog and light turned this course into tangible color spaces. Once passed, people were welcomed at the club area, filled with party energy. The industrial and rough touch of the room was set up in a luminous way: The columns were highlighted as characteristic elements, projector and plasma screens were set up to show moving aphorisms. What a memorable evening. The light installation project was realized in cooperation with the event agency Comeo. A special light art installation for the 100th anniversary of the Seidl mansion in Munich. mbeam enchanted this art nouveau mansion into a romantic Light Garden. For this light installation an artistically designed film was produced with views, perspectives and portraits of the Seidl mansion. Moving images were projected onto various places of the façade and roof. In addition, slide projectors were set up to portrait oversized people and faces on the facade. 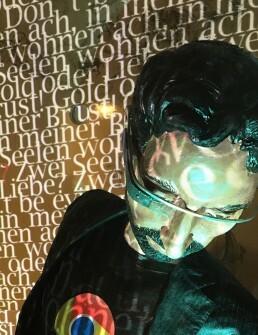 Light installation "inside-out – four Characters of Munich come alive." The Karlstor at Stachus welcomes and says goodbye to all visitors oft the pedestrian area. This is the western gate of the historic center and therefore a historic entrance to downtown Munich. Yet very few people know, that there are four so called “collar heads” worked into the main archway. They represent outstanding Munich characters, who are still present today with their sayings and jokes. We tell the stories of these four personalities with light (munichlights.de) and bring the exciting history of Munich to life. Moving images arise on the historic façade of the Karlstor – stories, associations, scene … the audience enjoys new moments again and again. This beautyful light installation was realized in cooperation with LiveCo, Veranstaltungstechnik GmbH and Matthias Singer, 507 Nanometer. Thanks to: Wolfgang Fischer, Citypartner München and the City of Munich. This is exactly what happened in the evening of the anniversary at the Munich Residenz. Standing in front of the building one could see unexpectedly into the private suites of the king and become a “secret” guest. Entire rooms as well as fine details of the interior became visible on the outside of the Residenz by using a high-power projector. From mid November until mid January the Brienner Straße is bathed in a very elegant glow: the big, historic street lights, who line the Brienner Straße from Odeonsplatz to the “Platz der Opfer der Nationalsozialisten” (Square of the Victims of National Socialism) turn into luminous chandeliers – a tribute to the historical development of one of Munich’s most significant boulevards. Historic flair is respectfully brought into the modern age of our 21st century: Each of the 16 chandeliers shine with 1000 LED light dots with an energy efficiency of approximately 120 W per chandelier. 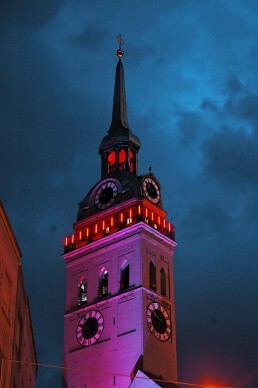 For the celebrations of the founding date of the city the facade of Munich’s townhall was turned into a canvas portraying a “Journey of color through color range” during darkness. With a lot of idealism and volunteers the urban professionals and mbeam prepared in cooperation with Procon and the Munich public works department an extensive light installation for the birthday celebration. The “Journey of color through color range” carries the spector on a spiral through the colors of the rainbow – the beautiful world of colors opens up. Pictures develop on the façade of the townhall – stories, dreams, associations, scenes… the spectator were taken continually to new highs. This project was realized in cooperation with Philipp Stegmüller, urban professionals. Munich is the city we live in. Munich inspires us and sometimes we get an innovative idea simply by just by walking though town. So it may happen that we develop on our own initiative high-quality light concepts, which inspire people. 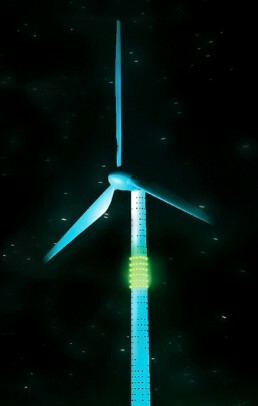 One of such ideas was the concept for the worlds biggest four-cylinder-(light)simulation at the BMW Tower in Munich, which won the if Design Award as well as a nomination for the design award of the Federal Republic of Germany. The light installation 4Z symbolizes the power of the engine, the centerpiece of “Freude am Fahren”. The BMW four-cylinder turns into an over dimensional architectural metaphor. Light - controlled with high precision - simulates the phases of combustion of the four-stroke engine. Discs of light move – it looks as if gigantic cylinder heads get into motion. The colors of each phase of combustion shine above Munich. The heart of the engine becomes alive. “Freude am Fahren” becomes alive and visible. 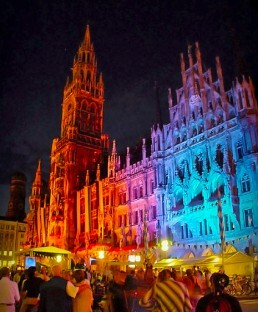 The Munich public works department hired mbeam for a light installation and sound orchestration to support an event. At the same time it was intended to flip the switch from past to future. The light installation took place on the 20.000 square meter big construction site, the future technology park M-Campus. The light installation along with a dramatic sound composition lasted 10 minutes and portrays the development of the area – from heavy industry terrain to a pioneering technology park for innovative companies through extensive revitalizing work. The 25 meter high timber construction, in style of a pagoda, was established in 1789/1790 by Johann Baptist Lechner, according to a design by Joseph Frey. The idea of the Chinese Tower was based on the twice as high “Big Pagoda” in the royal gardens “Kew Gardens” in London. This Big Pagoda again is a based on the Majolika Pagoda in the gardens of the Chinese emperor (Fragrant Hills-Park in Beijing). For a number of years, the Chinese Tower hosts a beautiful and romantic Christmas market during holiday season – a small insider tip, far enough away from the hectic downtown area during Christmas time. mbeam would like to reinforce this sensual and romantic character of this location. Big light balls in various colors, however only gently illuminated, enforce the peaceful atmosphere on this contemplative place and the spiritual character of this building. Even from a distance pedestrians are guided through the darkness to the luminous Chinese Tower on their wintery walk – for a hot spicy red wine (Gluehwein) and a tasty bratwurst. The bright dancing lights of the aurora are actually collisions between electrically charged particles from the sun that enter the earth‘s atmosphere.Auroral displays appear in many colours although pale green and pink are the most common. Shades of red, yellow, green, blue, and violet have been reported. The lights appear in many forms from patches or scattered clouds of light to streamers, arcs, rippling curtains or shooting rays that light up the sky with an eerie glow. Thousands of interactive light threads illuminated by thousands of tiny LED lights melt into a misty and mysteriously illuminated surface just like the Aurora Australis, the southern lights in the atmosphere. This surface of light softly pulsates in intensity and colours and swirls as if it would be somehow alive. Then a car is passing. The Light detects it and creates a light pulse that escorts the car as if by magic up to the main entrance. Hundreds of interactively Illuminated fibreglass sticks form the extension of the entrance in a swivelling path. The guest walks through and is escorted by the light. The hotel recognises the arrival or departure of the guest and gives him a warm welcome or farewell. Powerful projectors paint an Eastern Light to the building which is also constantly changing structure, colours and intensity. The island forms the closure of “Aurora Orientalis”. Water is pumped out of the sea and sprayed 70 meters wide and 30 meters high into the air where it atomizes into millions of microscopic droplets. Powerful beams of light capture the droplets and convert them again into a misty and mystical cloud of light that constantly moves and pulsates. A very powerful and constantly changing “Aurora Orientalis” emerges that will stun and amaze the viewer. For the 30th anniversary of the Olympiapark in Munich the Olympia Tower was intended to be turned into a highly visible and PR-relevant light art object. mbeam created an “Olymeter”, the worlds biggest HydroMeter (green), ThermoMeter (yellow), BaroMeter (blue) and LightMeter, as a “weather forecast” for Munich. The interaction between light-color and -intensity and metrological data creates a dynamic and constantly changing work of art with information content. Because of its uniqueness mbeam won the renowned IF Design Award. Visitors and guests are informed via the Internet, media, posters and billboards and a flyer about the function of the art work. What color announces what weather condition? This turns Munich residents into weather experts. And we are proud that the Olympia Tower is now the worlds biggest thermo- and barometer! Knowing what the weather brings is a desire of mankind ever since. From the end of November until mid January the beautiful Viktualienmarkt in Munich appears in a wintery gloss: the maypole on the market square was turned into a Christmas tree. 28 street lamps were festively decorated and illuminated the Viktualienmarkt. The Lisl-Karstadt- as well as the Karl-Valentin-Fountain shined bright and created a magical and festively light atmosphere. Note: The entire Christmas production “Maypole”, the 28 street lamps and the two fountains were set up with energy efficient LED light. Thanks to the Munich market halls for the pleasant collaboration. Read about “Victuals Market Munich” on Wikipedia. At the latest since 2013 Munich is the capital of soccer. In Germany for sure, if not in the whole of Europe. Soccer moves people, pulls in, brings together and unites. We would like to visualize all this for the State Capital of Munich – ideally in the metro as this transportation vehicle brings fans into the stadium. 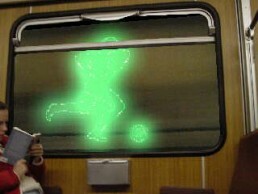 A soccer player is projected in his various running positions and phases of ball possession onto the walls of the tunnel in LED. Due to the travel motion of the train all individual pictures merge together, so we can actually see a running and dribbling soccer player. The final shot at the goal signalizes the approaching station. 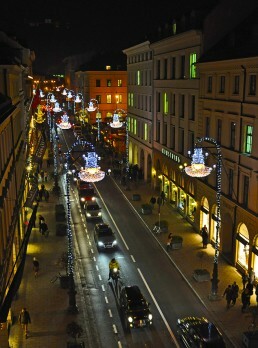 The State Capital of Munich is famous for its exceptional Christmas atmosphere. Glittering lights attract locals as well as countless visitors from all over the world to stroll and shop. This year, the Maximilianstrasse with its rich tradition invites us to marvel and enjoy during Advent- and Christmas-time. Powerful initiators such as Jeweller Hemmerle and the Hotel Vier Jahreszeiten supported the “Christmas Sparkle” project together with CityPartner München, an association to promote the interest of Munich-based organizations. Prior to implementing the project it was important to get public authorities excited. Due to the fact that the Maximilianstraße is – as well as the entire downtown area – a historically protected ensemble it is necessary to get special approval for such a light installation. Besides the Ludwig-, Prinzregenten- and Brienner-Straße the Maximilianstraße is one of four boulevards from the 19th century. Can medial advertising spaces be art? The answer is: Yes. Can they be so artistic that they can become one with location and become a part of it? Yes! With T(ixel)2 a spectacular, specially customized media-art-exhibition-space emerges at the Munich Airport. It can be utilized for both, art performances and as an exclusive advertising space for premium brands. Starting position is the remarkable visual axis from the MAC Forum onto the 180 m wide glass facade of Terminal 2. Due to its architecture a grid of horizontal and vertical lines evolve. This grid serves as the starting position for an new interpretation in the area of surfaces utilized for media purposes: The struts are completely equipped with steerable, multicolored LED lines , so that the entire surface can be filled with light. Picture and text are broken down into lines, instead of pixel (picture elements) “Tixel” (picture lines on Terminal 2) emerge. The media column works during the day as well as during the evening and at night. The coating is printed with images. This way the column can have an effect during the day in a traditional way. In the evening and at night action comes into play. Light dots, set up in a grid, produce animated ski jumpers, figure skaters etc. Light animations play with the colors of the Olympic rings. One light source shines inside and creates more perspective. The illumination from above closes the column again, the printed pictures become visible. The function and architectural beauty of Siemens parking garage is integrated into the urban surroundings via a dynamic light production. The subtle concentration of light guides the user into the entrances. 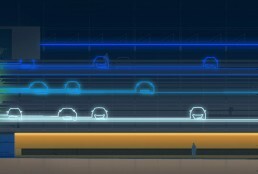 The reduced silhouette of cars is held in cool and technical tones of blue to carry the function of the building and makes it visible. The highlighted base area of the façade runs around the entire building and gives it a solid foundation. Proactive, urban initiative – without a commercial purpose and with an ironic twinkle in the eye – to embellish construction gaps according to the motto: “Delighting Gaps”. Light art makes unexploited urban areas and untapped construction gaps glow and amazes people, who pass by. Residents, pedestrian, visitors of the Munich Oktoberfest enjoy the urban gem in the Bavariastrasse 25, on the corner of the Lindwurmstrasse in Munich. Here a construction gap was turned into a show gap. 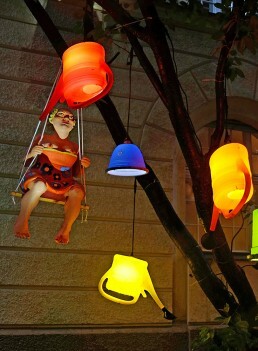 In cooperation with Lichtconcept mbeam installed a light object in a ironic yet affectionate way. Just in time for the Munich Oktoberfest a shining light light tree decorates the otherwise ugly construction area. Scattered fruits lay in the grass, the summer comes to an end, the days get shorter, the (light) tree safes all his energy for the upcoming winter. For some reason this curious light object aligns with the loud and wild spectacles of the biggest public celebration in the world. The period of the promotion was from September until October. The initiative stands for the chances of temporary solutions with regards to urban development activities on loss-making construction areas. Light installations solve the problem of unattractive construction gaps quickly and with reasonable effort and close townscapes. Instead of looking away you take a closer look. Constructors can generate curiosity and a positive image and carry desirable messages at an early stage. mbeam would like to contribute to make German cities more attractive and future-oriented. Thanks to Cordula and Peter Linner. As part of the third Munich Cult(ure)-Shopping-Night the Kaufingertor, a shopping passage, participated with event- and supporting program to present itself as a vivid and attractive shopping mall. mbeam was responsible for the conceptual design and implementation of a light installation plus the accompanying high-profile activities. Core element of this exceptional light show was “Mr. SuperLight”, the light conductor. To special composed music he swung his conductor’s baton and let the sky projectors, spots and moving heads dance to the beat and sounds in the Kaufingertor. In multiple scenes Mr. Superlight lived through various emotional states, from stress and ecstasy to a good night rest and rocketed the Kaufingertor and its awed visitors into another world. 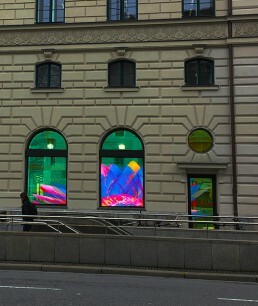 As part of the 1st Munich Cult(ure)-Shopping-Night the Kaufingertor, a shopping passage, participated with an event- and supporting program to present itself as an attractive, alluring and vivid highlight. mbeam was responsible for the conceptual design and implementation of a light installation plus the accompanying high-profile activities. Thereby the Kaufingertor was set in stage according to the occasion. Besides the exceptional light production of this popular shopping mall, mbeam ensured unique shopping acts. For example Voices in Time, an internationally successful Rock & Jazz Choir, performed. As well as a dancer, who impressed with spectacular shadow dances. Imagine there is a light sculpture in front oft the Maximilianeum (the House of Representatives of Bavaria), which reproduces in an interactive way up to date statements from speeches and citations of world politicians (Ban Ki-Moon, Kofi Anan, Nelson Mandela), high-level representatives of the public, church, arts as well as Bavarian politicians. The observer gets introduced to the international affairs and its interconnectivity. He can grasp the correlations with local topics and its inter-linkages. Politics becomes a tangible experience and the interests increases with the knowledge that all occurrences on our earth influence our daily lives and are linked with each other. The Maximilianeum becomes a stage of local and global news and therefore a magnet for local residents as well as national and international visitors. The incredible perspective onto Munich’s boulevard, the view onto the Feldherrnhalle, will be extended in a spectacular way during Christmas time. The light installation “view into the land” arises in the middle of the city. We can see through the arches of the hall into the Bavarian winter wonderland. Snow flakes are fluttering down and a charming atmosphere arises. Almost like looking through a window, the Feldherrnhalle presents us a new view, onto the snow-covered meadows and fields outside the gates of the Bavarian capital.